Beef rib-eye steaks are tender and delicious, but this flavorful dry marinade can give any steak a lift. Make a large batch of the dry rub and store airtight in a cool dry place. It's also good rubbed on pork, chicken, or turkey. 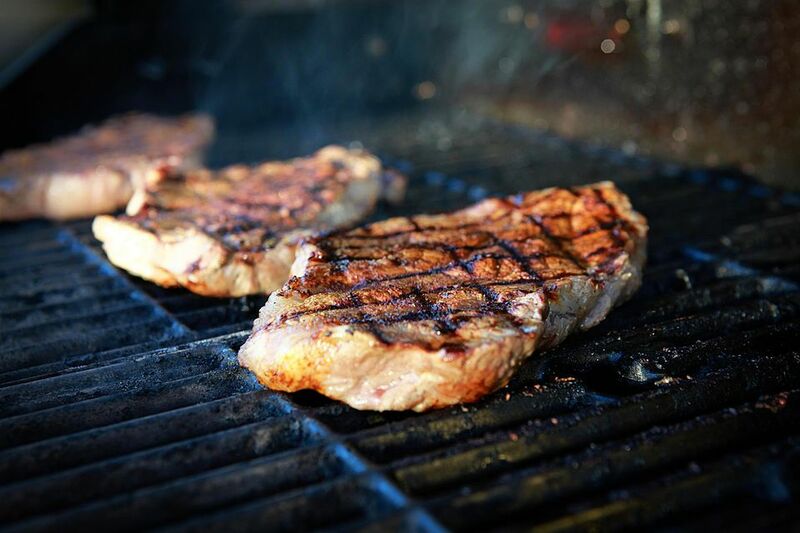 Also, be sure to check out our tips below for making the perfect grilled steak! In a small bowl, mix the garlic, black pepper, mustard, paprika, chili powder, thyme, salt, and cayenne until well blended. Brush the oil on both sides of the steaks and place each steak on a large sheet of plastic wrap. Rub the spice mixture on both sides of steaks. Wrap tightly and refrigerate at least 1 hour or up to 24 hours. Heat a gas grill to high, prepare a hot charcoal fire until the coals form white ash, or heat a broiler. Grill or broil the steaks 4 to 6 inches above the heat source for 5 to 7 minutes on each side for rare, 7 to 9 minutes for medium, or 9 to 11 minutes for well-done. Remove the steaks to serving plates and garnish with thyme sprigs. If using a charcoal grill, start the fire 30 to 40 minutes before grilling. The fire's ready when the coals look ash-covered and you can hold your hand 4 to 5 inches (grill height) over the coals for about 4 seconds before it's too hot to continue. Trim all steaks of any excess fat. Lightly brush steaks and the grilling surface with oil to prevent sticking. Grill 1-inch-thick steaks 12 to 14 minutes, turning once, for medium rare; 5 minutes longer for medium. Grill 18 to 20 minutes for 2-inch-thick steaks (5 minutes longer for medium). Make a small cut in the thickest part of the meat and check the color to tell if it's done. Or touch it. Rare will be soft, medium will give slightly, and well done will be firm. For steaks more than 1 1/2 inches thick, insert a meat thermometer into the thickest part—145 to 150 F is medium rare, 160 F is medium. Let steaks stand a few minutes after grilling to give juices a chance to settle and meat to firm up for easier slicing. Whether you're looking to make the perfect steak, juicy burgers, or perfecly fried chicken wings, our cookbook has you covered. Get it free when you sign up for our newsletter.